Following after Lenovo’s market success in its IdeaPad Y580, Lenovo lost no time introducing its next gaming laptop in the IdeaPad Y500 using the Nvidia’s Kepler architecture to create one of the most muscled graphics engines on the laptop. Costing slightly lower than the $1,000 price point, the Lenovo Ideapad Y500 offers a stunning full high definition 1920 x 1080 resolution on a 15.6-inch LED backlit screen. There is nothing outstanding in its minimalist body aesthetics, but what makes it an outstanding gaming laptop is the modest price tag that can deceive the consumer about its power under the hood. 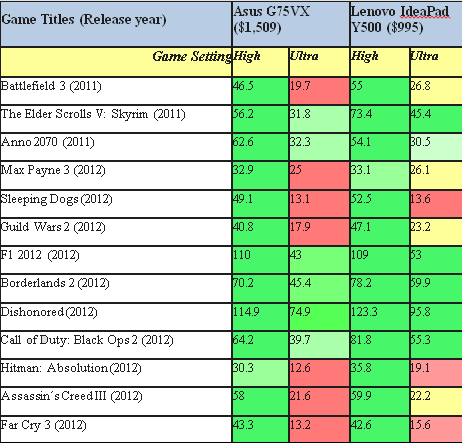 Lenovo Ideapad Y500 is the #1 Laptop on performance to price ratio category – Rated #1 on my list as a must have laptop. 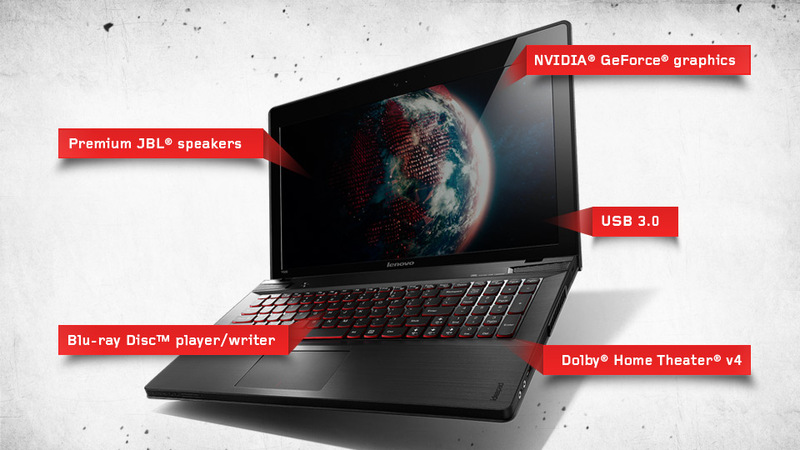 Y500s muscle can outperform almost all the gaming laptops on 1600-1000 price range. Priced @ 995 stocked with 3rd Gen i7 cpu and Dual Nvidia 650 SLI(which outperforms 670 by a mile) Its a must have for bang for the buck/best deal seekers. EDITORS CHOICE! The Lenovo IdeaPad Y500 is powered by a 3rd generation Intel Core i7-3630QM dual core engine from its Ivy Bridge (22 nm) processor family. It is supported by a 6 MB L3 cache and a 16GB DDR3 system RAM. Consuming 45 watts of power, the CPU has no problem handling the most demanding CPU-intensive applications for home, school and office. The CPU comes integrated with the HD Graphics 4000 GPU which is our basic graphics engine to qualify a s a gaming laptop, but Lenovo has disabled this and its Optimus switching technology in favor of using the SLI feature to use two graphics cards instead. Gamers will delight with its Turbo Boost technology that enables dynamic overclocking which can push the default 2.4 GHz clock speed to a theoretical maximum of 3.4 GHz. With most apps and games, the typical clock speed is 3.0 GHz under the CPU-intensive Cinebench R11 and the GPU-heavy Unigine Heaven benchmark tests. Just exactly how fast is the Lenovo IdeaPad Y500? Just to get a good idea, our Cinebench R10 tests (Table 1)showed that in just about all tests, the premium Razer Blade, highly acclaimed by serious gamers around the world, was almost 8% slower in CPU-intensive tests. The comparison may be a bit strained considering that the Razer Blade RZ09 we tested was powered by a marginally slower 2.2 GHz i7-3632QM processor. But not when you consider the price difference and that fact the both machines target the same serious gaming markets. In fairness to Razer, its product sports a larger 17.3-inch screen and despite having a small but innovative touchscreen on the keypad, it just a incrementally heavier at 6.6 lbs compared to Lenovo’s 6.4 lbs and is half an inch thinner than the Lenovo. But the impressive numbers on the Cinebench tests can’t be dismissed given the yawning disparity in price points. Lenovo’s system’s designers clearly made some smart component decisions to arrive at this level of power at such a low price. Outperforms 670 by 10% based on 24 games tested. A single GeForce GT 650M GPU lags behind by about 60% to 66% in all benchmarks. Using two of these cards in SLI mode achieves a performance gain between 0 and 90% depending on the game. The GeForce GTX 670MX which is the closest equivalent to the GT 650 in SLI mode lags marginally by 10% . A laptop will need to use a single GeForce GTX 675MX which is the high end Kepler-based GPU to have a better performance of about 20%. Lenovo opted to use a faster 2 GB GDDR5 video RAM over a 128-bit memory bus. It is clocked 790 MHz is slightly above the average clock rate of 768 MHz and no boosting to its maximum 835 MHz is done. The typical GDDR5 models tested are often set at 745 MHz (i.e., Asus UX51VZ, Alienware’s M14x R2, Dell’s Inspiron 17R, and the MSI’s GE60/GE70). Using the latest ForceWare 310.90 GPU driver version to get the highest possible graphics card performance, the tandem achieved a score of 3,612 on the 3DMark 11 at 1280 x 720 screen resolution and slightly overtook a high end GeForce GTX 670MX which is also in the Kepler architecture series (3,567 points using the Asus G75VX- DH72-CA costing $2,146). It should be noted that a single GT 650M yields a 40% lower benchmark (2,100 points on the Dell Inspiron 17R). In terms of frames per second (fps) and using the Unigine Heaven 3.0 benchmark with the IdeaPad Y500 screen configured at its highest HD default setting of 1920×1080, the dual GT 650M in SLI mode achieved 47.6 fps while the single GTX 670MX achieved 45.2 fps. On the other hand, a single GT 650M can only process at 35.8 fps which is below the 40 fps that we consider as respectable for smooth frame to frame transition. You can have the best deal here. Its gaming performance is something you would find only in laptops costing $400 more or higher as even the most demanding games can be played seamlessly at medium to high game settings (See Table 3). After several gaming benchmarks, we can say that an SLI array of two GT 650M cards is an appealing option for serious gamers who want to have a semblance of desktop gaming power with portability at a price point that won’t break their bank accounts. As Table 3 clearly shows, most games will have no problems running on the Y500’s default HD resolution of 1920×1080 pixels but only when the 4x anti-aliasing and ultra-level game settings are turned off. High graphics settings with 2x anti-aliasing are rendered smoothly in most games without the need to reduce the screen resolution. The Asus G75VX costing $1,509 but with a larger 17.3-inch screen, uses a single GTX 670MX tested to be 10% less powerful than the GT 650M on SLI mode. Powered by the same i7-3630QM quad core processor, its gaming performance in terms of graphics rendering in fps trails behind the Y500 as shown in Table 4. Lenovo Ideapad Y500 outperforms much expensive gaming laptops based on our comparisons. Storage. The Y500 comes standards with a 1TB SATA drive running at 5400rpm as well as a standard optical drive on a weight managed 6.4lb body. The absence of a solid state drive may seem like a design oversight but the Y500 has a 16 GB ExpressCache that effectively serves as the SSD to speed up first time booting and application launches by 30% while helping I/O intensive games to fetch new gaming levels, maps and textures at data transfer rates you won’t get with hard drives. Windows 8. The 64-bit version is bundled with the unit. Sound System. You get a Dolby Home Theater v4 audio processing system, and two premium JBL speakers that provide above average sound quality for a laptop. Battery runtime: It has a 6,700 mAh Li-Ion battery that can provide 1.5 hours of runtime at full load, 3 hours surfing on WiFi and 4 hours when idle. Warranty. It comes with a 2-year warranty. Wireless connectivity. It comes with the Centrino Wireless N-2230 along with the usual Wi-Fi 802.11 b/g/n and Bluetooth 4.0. Wired connectivity. It has two USB 3.0 and one USB 2.0 ports, audio jacks (in and out), HDMI and S/PDIF jacks, an RJ45 Gigabit LAN support and a card reader that supports 6 formats. The Y500 can exhibit some annoying screen display lags that can occur with frame spacing variation caused by changes in vector graphics calculations that affect all dual and multiple GPU implementations. 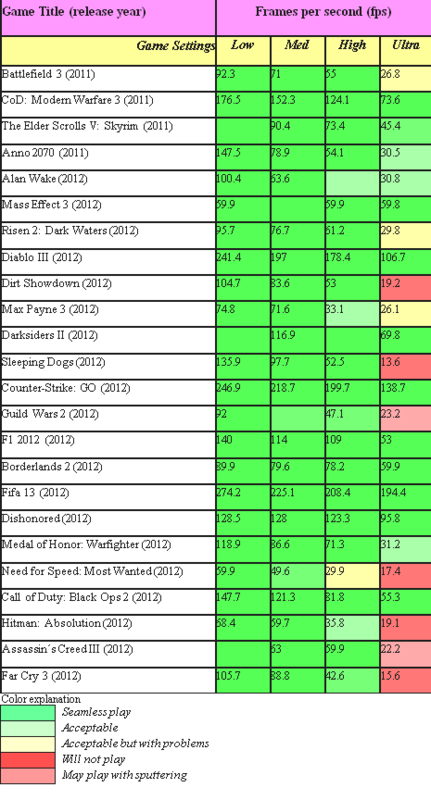 Not all games suffer from it but those displaying at 40 fps and below are most susceptible. Despite slower performance, a single GPU like the GTX 670 MX can appear smoother overall. And while the relatively high quality screen does an excellent job in displaying rich vivid colors, its glossy surface diminishes its vibrancy as it creates significant glare to make it less than desirable to use outdoors or in highly lit ambient locations. Lastly, the difficult mouse buttons integrated on the 4.5-inch trackpad may be an inconvenience but we’re pretty sure gamers will prefer to use an external mouse when using the Y500. Given Nvidia’s superb driver support, the GeForce GT 650M shows its mettle in SLI mode to allow the serious gamer to enjoy just about all the demanding RPG and FSP games on the market. But apart from its obvious raw gaming muscle, the Lenovo’s IdeaPad Y500 becomes inconspicuous with all the other features of a gaming laptop such as temperature, HDD and fan noise, weight and battery life. Serious gamers looking for great value in a versatile and powerful gaming laptop need not look farther than the Lenovo IdeaPad Y500. A little nitpicking may reveal some design flaws in the trackpad but overall, this 15-incher’s gaming muscle can easily outflank most desktop gaming systems while giving you the portability to enjoy your games anywhere in the house, campus, office or while on the road. Sure, you can always find a faster more powerful gaming laptops. But truth to tell, gaming power and affordability rarely go together and the Lenovo IdeaPad Y500 has both. There is no other laptop in the market today that offers the same gaming prowess in the $1,000 price point, making the Lenovo IdeaPad Y500 the best value proposition for a full desktop-like gaming station that you can lug around. You can buy it at the best price here. Lenovo Ideapad Y500 Review - The Best Gaming Laptop Under 1000. Equipped with 3rd Gen Core i7 Quadcore Processor with Dual 650 SLI Video Card.